Thousands of Palestinian Arabs riot in Qalandiya, throw rocks, firebombs and use live fire against IDF and Border Police officers. 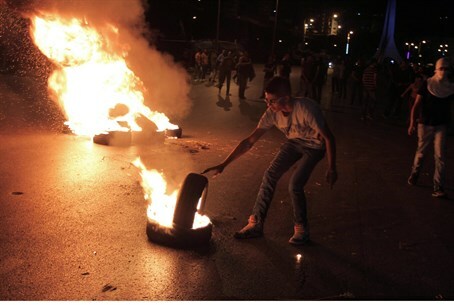 Thousands of Palestinian Arabs rioted in Qalandiya, between Jerusalem and Ramallah, on Thursday night. No Israeli officers were hurt in the clashes, but Palestinian Authority officials claimed that Israeli security forces shot dead one man and wounded 150 other people. PA security and medical officials named the man as Mohammed Al-Aaraj, 25, and said he was among at least 10,000 people clashing with soldiers and border police. They said that at least 150 people were injured by live fire in the protest, and five were in critical condition. The IDF told AFP that live fire was used in a confrontation with thousands of rioters after they threw rocks, firecrackers and petrol bombs at soldiers and border police. Channel 2 News reported that 39 people were arrested during the riots. Earlier on Thursday night, clashes also broke out at the Temple Mount, as Arabs threw rocks and targeted police with firecrackers. Two officers were lightly wounded. Ten rioters were arrested. Kol Yisrael radio that Palestinian Arabs and troops also clashed around the Shechem, Hevron, Bethlehem and Tulkarem. Also on Thursday, police arrested two Arabs near the Damascus Gate in Jerusalem after they attacked police with rocks and stones. Police broke up the riot using water cannons and other anti-riot methods. In another incident, dozens of Arab youths tried to break through a police barrier. Police broke up that riot and arrested three rioters for attacking police. At the same time, dozens of Arabs gathered near the Old City and tried to destroy a police barrier there as well. Three more extremists were arrested at the Flower Gate in the Old City.